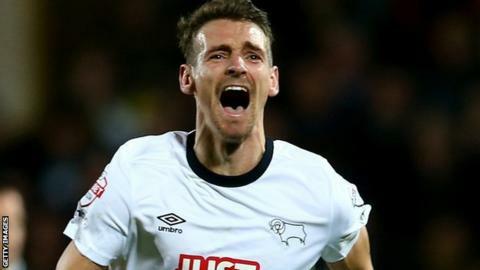 Derby went clear at the top of the Championship after Craig Bryson's impressive strike from outside the area saw them win at Watford. Jordan Ibe put the Rams ahead six minutes before half-time when he found the net from 20 yards. The hosts dominated much of the second half and Gianni Munari struck a deserved equaliser from close range. But Bryson secured the win for Steve McLaren's side when he fired high into Jonathan Bond's goal. The Rams looked lively early on and Jeff Hendrick went close when his shot from 20 yards was tipped onto a post by Hornets keeper Bond. Lloyd Dyer had Watford's first clear chance when his shot from inside the box was saved by Jack Butland. The Rams keeper denied the Hornets a number of times, in what could prove to be his last appearance with his loan deal from Stoke set to end next week. The England international thwarted Troy Deeney and Fernando Forestieri before the Argentine-born Italian striker was denied another attempt by Craig Forsyth's tackle. However, it was derby who took the lead when Ibe chested down Johnny Russell's pass before curling a shot past Bond. Deeney was denied again by Butland and Forestieri fired wide twice, but Munari levelled matters soon after when he beat the goalkeeper from inside the box. But Derby responded positively again and, after Forsyth's attempt was blocked by Bond, Bryson found the net with his side's second long-range strike of the match. Watford poured forward in search of a second equaliser, but Butland ensured the Rams claimed all the points to move three clear of Bournemouth at the top. Watford manager Slavisa Jokanovic: "We played the first 45 minutes without energy. We didn't play a good game and we didn't press them really. With the goal, we were a little bit scared. "We weren't being brave and played many passes at the back slowly. We had many problems in the first 45 minutes." Derby manager Steve McClaren: "I thought we'd lost our moment. We needed a second goal and we should have had that. We were losing it, having dominated the game for an hour. "We played great possession football, some great chances, a great goal and were in the driving seat and in control. But you can't go through 90 minutes at a place like Watford with the quality they've got and not expect to come under some pressure." Match ends, Watford 1, Derby County 2. Second Half ends, Watford 1, Derby County 2. Corner, Derby County. Conceded by Daniel Tözsér. Daniel Tözsér (Watford) is shown the yellow card for a bad foul. Troy Deeney (Watford) is shown the yellow card. Gianni Munari (Watford) is shown the yellow card for a bad foul. Simon Dawkins (Derby County) wins a free kick in the defensive half. Foul by Gianni Munari (Watford). Attempt saved. Ikechi Anya (Watford) left footed shot from the left side of the box is saved in the centre of the goal. Assisted by Matej Vydra. Corner, Watford. Conceded by Richard Keogh. Corner, Watford. Conceded by Ryan Shotton. Attempt blocked. Matej Vydra (Watford) right footed shot from the centre of the box is blocked. Assisted by Ikechi Anya. Corner, Watford. Conceded by Cyrus Christie. Lloyd Doyley (Watford) is shown the yellow card for a bad foul. Foul by Lloyd Doyley (Watford). Goal! Watford 1, Derby County 2. Craig Bryson (Derby County) right footed shot from outside the box to the top right corner. Assisted by Craig Forsyth. Corner, Derby County. Conceded by Jonathan Bond. Attempt saved. Craig Forsyth (Derby County) left footed shot from the centre of the box is saved in the centre of the goal. Assisted by Johnny Russell. Joel Ekstrand (Watford) wins a free kick in the defensive half. Attempt missed. Johnny Russell (Derby County) header from the centre of the box is high and wide to the right. Assisted by Craig Forsyth with a cross. Attempt blocked. Fernando Forestieri (Watford) left footed shot from outside the box is blocked. Assisted by Juan Carlos Paredes. Substitution, Watford. Ikechi Anya replaces Lloyd Dyer. Attempt blocked. Troy Deeney (Watford) right footed shot from the left side of the box is blocked. Assisted by Fernando Forestieri. Attempt missed. Matej Vydra (Watford) left footed shot from outside the box is close, but misses to the left. Assisted by Fernando Forestieri.